Stephen Biddulph was brought to my attention just under 12 years ago. I was pregnant with my second daughter. Apparently by the way I was carrying I was told I was having boy – apparently I was carrying in the back – so the book was gifted to me. I can still remember my Consultant laughing as I read the book whilst waiting for my scan, he did the usual procedure and announced I was having a girl, so much for old wives’ tales! Even though I had a girl, was very happy, and she arrived safely into the world at a stonking 9lbs, Raising Boys was an interesting read. I was really disappointed when I missed one of Stephens’s many talks he conducted in the UK at various girls’ schools. There’s a scientific difference between boys and girls and it’s quite mind blowing. Every child needs a mother’s love and security for the first 5 years of their lives, if they are blessed enough to have both mum and dad then even better. From about age 6 onwards both parents are paramount. The personality starts to form and boys need a father to “shape” who they are and what they will become and Dad is the first example he will get this knowledge from. Primary schools are also top heavy with female teachers and most of a boy’s communcation will be spent engaging with a female in authority. From about age 11 onwards boys require an additional male role model who will work alongside dad, now this could come in the form of a sports coach, martial arts teacher, or someone who will echo what dad says without appearing “threatening”. 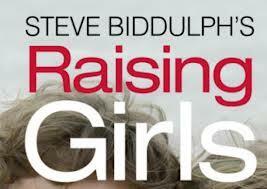 Girls need a different type of attention and according to Stephen Biddulph they need it much earlier. Girls are also “in trouble” quotes the author. The universal deterioration of girls has hit us quite quickly. We can’t state when it started but the qualities we used to be proud of in our girls have just dissappeared. Laying the foundations in the first 5 years is more of a task now than it was 10 years ago, and by tweenie stage(8 to 12yrs) if we don’t get the communication correct the teenage years could become quite tumultumous. There’s an issue of being the older girl at Primary School in Year 6 then making the transition to becoming the baby of the school again as they move into Year 7, the first year of High School. Statements echo such as “what shall I wear to school today”, as oppose to “what are we learning or doing at school today”. Advertising, marketing and the new media revolution – especially You Tube – also play their part in that pre teen era when girls almost “re-sponge” themselves soaking up images which never affected them before. Clothing, hair colour, body consciousness, nails etc etc, all become more visual to girls and this can change their personality and send them into a direction they had never expressed an interest before. And that’s just the icing on the cake!! Have you found a difference in raising boys and girls? Would be interested to know your thoughts. AMAs: Did You Watch It?